Milligan College, TN (October 2, 2008) – Milligan College’s new Gregory Center for the Liberal Arts is a flurry of activity as the college’s music area prepares for their annual Broadway revue, “Step into the Spotlight,” on Oct. 24 and 25 at 7:30 p.m.
“Step into the Spotlight,” a revue of upbeat spirituals, stage and film music, will combine the talents of the Milligan Concert Choir and Orchestra . The revue will feature solos, ensembles and choral numbers from “Annie,” “Guys and Dolls,” “O Brother, Where Art Thou?” and “Hairspray.” The songs of Irving Berlin also will be highlighted. Additionally, a group of male choir members will sing barbershop selections. Co-directed by Brown and Dr. John Wakefield, associate professor of music at Milligan, the show is choreographed by Robin Bailey Beals from Gay Whitt School of Dance in Johnson City. Pianist Joel Buckner serves as accompanist. 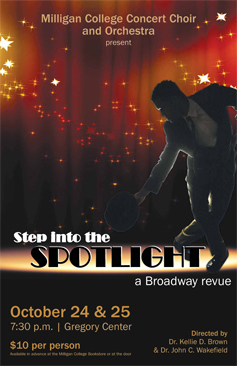 Tickets for the Oct. 24 and 25 performances of “Step into the Spotlight” are $10 and can be purchased in advance at the Milligan College Bookstore, 423.461.8733. Tickets may also be purchased at the door prior to the show; however, advance reservations are encouraged based on previous year sell-outs. Posted by tommy on October 2, 2008.